Raphael Honigstein assesses the possibility that Jadon Sancho will leave Borussia Dortmund this summer. 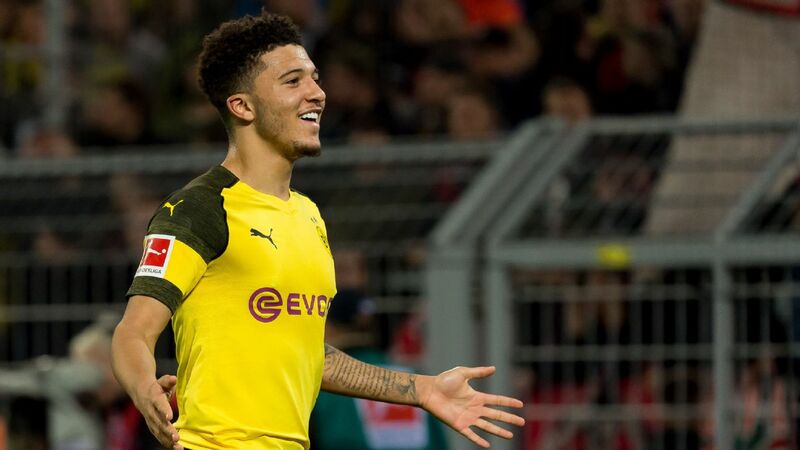 How much longer Jadon Sancho stays at Borussia Dortmund remains to be seen, and the Independent reports that Manchester United are set to make him their No. 1 summer target. Ole Gunnar Solskjaer wants former Man City player Sancho to line up alongside Marcus Rashford and Anthony Martial in what would be one of the fastest attacks in world football, but would leave no room for Chile international Alexis Sanchez. United are likely to face opposition for Sancho -- who could cost upwards of £100 million -- with Paris Saint-Germain and Real Madrid keen. But the England international's possible sale would represent a very healthy profit on the £8 million Dortmund paid for him in 2017. The 19-year-old has three years left on his contract, meaning the Bundesliga club hold all the aces. However, Sancho is understood to be in no hurry to leave -- hardly surprising given his outstanding form since he moved to Germany. Ole Gunnar Solskjaer has plans to make Man United's attack the fastest in world football, with Jadon Sancho the centrepiece. 24.00 GMT: That will wrap up another edition of Transfer Talk LIVE. We hope you enjoyed following along with all the latest transfer rumours and rumblings and remind you to check back shortly for more transfer buzz. Goodnight! 23.20 GMT: Man United to get rid of five of the club's highest earners ahead of expected summer shake-up? Old Trafford sources have hinted that Ander Herrera, Juan Mata, Marcos Rojo and Antonio Valencia are all expected to leave the club -- with the possibility of Alexis Sanchez joining them. Herrera has been linked with a move to PSG, Mata to Barcelona, while Rojo has become a forgotten man and Valencia at 33 seems unlikely to extend his stay. Sanchez will be the interesting case as United surely want to move on from him but his £500,000-a-week wages make finding a suitor for the Chilean difficult. With Ole Gunnar Solskjaer now confirmed as permanent boss, United are expected to undergo a major overhaul in the summer and with linked targets like Jadon Sancho, Declan Rice and Aaron Wan-Bissaka expected to cost over £200 million, United will need to free up some cash. 22.34 GMT: While Eden Hazard's uncertain future is well documented, rumours are swirling that he may not be the only Chelsea winger on the move this summer. The Express writes that veteran winger Pedro could join Hazard out the door, with Italian giants AC Milan and Inter set to battle over the Spaniard. Pedro, 31, will be entering the final year of his contract next season and this season has eight goals for the Blues. With a transfer ban going into effect this summer it would seem unlikely that Chelsea would let two wingers go, despite Christian Pulisic joining from Borussia Dortmund and Callum Hudson-Odoi looking ready for an increased role. The LA Galaxy have made a trade to acquire... drum roll please... an International Roster Slot. The full trade breaks down as the Galaxy trading $100,000 in General Allocation Money and $75,000 in targeted Allocation Money for a 2019 International Roster Slot. Now we wait and see what the Galaxy will do with their new prized asset. 21.09 GMT: Hull City are reportedly weighing up a move for Cardiff defender Ryan Pryce. The 21-year-old joined the Blue Birds from Welsh Premier League side New Saints but has yet to make a first-team appearance under Neil Warnock. According to Peter O'Rourke of HITC, via the Hull Daily Mail, Hull Portsmouth and Fleetwood Town are all interested in the young full-back. West Brom will have a tough decision to make on Salomon Rondon's future this summer. Rondon has scored 10 times for Newcastle while on loan from West Brom but the Venezuelan has a £16.5 million buyout clause if Newcastle want him on a permanent basis. The Daily Mail reports that while Newcastle like Rondon, they are hesitant to spend over £12 million on a player that is set to turn 30 in September. If Newcastle decide to pass on Rondon, Hoffenheim's Joelinton is a player to keep an eye on, with various reports linking the Tyneside club with the £45m rated Brazilian. 19.52 GMT: Raul Jimenez has been immense this season for Wolves while on loan from Benfica and could soon be set to join the club on a permanent basis. The Mexican has 12 goals and seven assists in the Premier League for Wolves this season, factoring in on nearly half of the club's 40 goals. Multiple sources in England claim that Wolves are set to confirm the outright signing of Jimenez for £30 million as early as Thursday. Great news for Wolves as Jimenez has developed a terrific partnership with Diogo Jota up front and manager Nuno Espirito Santo was keen to secure his long-term future. 19.06 GMT: After Alfredo Morelos' latest blow up and red card, Rangers seem ready to move on from the Colombian -- despite his prolific goalscoring record. The Scotsman claims the Glasgow club are considering young Polish striker Adam Buksa as an alternative to Morelos. The 22-year-old has hit nine goals in 17 league games for Pogon Szczecin and has previously played for Poland at the Under-19 level. Morelos, who has scored 29 goals this season, has also been sent off five times and seems to have finally used up any remaining goodwill with manager Steven Gerrard and the Scottish club's supporters. 18.37 BST: Amid increasing speculation that Paul Pogba could be on his way from Manchester United to Real Madrid, the Manchester Evening News reports that ex-United midfielder Paul Ince believes Pogba will not still be at Old Trafford next season. 17.56 BST: Manchester United have been strongly linked with a potential summer move for Real Madrid defender Raphael Varane, but the Mirror reports that the France international is also interesting Paris Saint-Germain and warns that they "face a fierce battle" for his signature. 17.27 BST: The Liverpool Echo reports that an adviser to Everton midfielder Idrissa Gueye believes there will be further interest in him when the summer comes around. Paris Saint-Germain were strongly linked with Gueye in January, and could make a new attempt to sign him at the end of the season. 16.43 BST: To Arsenal, where academy graduate Zak Swanson has put pen to paper on his first professional contract. Swanson, 18, is a midfielder but can also operate in defence. 16.00 BST: The Daily Mail suggests Benfica's Alex Grimaldo could be the player Manchester City turn to as they look to bolster their left-back options. City sporting director Txiki Begiristain recently scouted the young Spaniard. 15.20 BST: Champions League elimination has been playing on the mind of PSG fullback Dani Alves, who has sought assurances from the club about their ambitions before committing to an extra year. Le Parisien reports that Alves, whose contract expires in June, has questioned the character of some teammates as well as the direction which the club is heading. 14.39 BST: Philippe Coutinho would prefer to move to Chelsea than Manchester United, according to Spanish outlet SPORT. Stamford Bridge looks to be his preference because of his links to the fellow Brazilians who play for the Blues, while a move to United would potentially sour any relationship with his former club Liverpool. 13.57 BST: Manchester United are rumored to be looking to replace Ander Herrera and will be splashing out close on £40 million for the services of Youri Tielemens. The midfielder is currently on loan at Leicester from Monaco and Belgain newspaper outlet HLN believes he could be a target to bolster the United squad for next season. 13.05 BST: Spanish publication AS Football says Gareth Bale is key to a deal that could bring Paul Pogba to the Bernabeu in the summer. Real Madrid manager Zinedine Zidane is an admirer of Pogba but, in order to fund a transfer, the club will have to offload Wales international Bale first. 12.24 BST: New Barcelona signing Frenkie de Jong has admitted he thought long and hard about a move to Tottenham before putting pen to paper on a deal with the Spanish giants. In an interview with FourFourTwo, the midfielder said: "I considered their [Spurs'] offer long and hard. I see Tottenham as a very stable club, and they are only getting better. They give young players a chance and I see Mauricio Pochettino as a manager who really improves young players." 11.53 BST: Sport Bild reports that RB Leipzig appear to be interested in loan moves for Chelsea's Tammy Abraham and Mason Mount as they prepare for the departure of prolific frontman Timo Werner at the end of the season. Werner has been the subject of intense speculation, with talk of a big money move to Bayern Munich intensifying. 11.07 BST: Atletico Mardrid's attempts to convince Antoine Griezmann to stay continue, with Rodrigo Hernandez telling reporters: "I hope he stays as long as he can. He has scored after several games without scoring. Let him stay as long as he can." 10.22 BST: Staying in Germany, Borussia Dortmund's star forward Marco Reus is likely to retire at the club according to BVB CEO Hans-Joachim Watzke, who told Eurosport: "He's the captain. It's his club. Borussia Dortmund to him is more than just an employer." 09.40 BST: Bayern Munich coach Niko Kovac has called Germany international Kai Havertz one of the future stars of football, a week after the Leverkusen midfielder was linked with a €100m move to Bayern in 2020. "He's an absolute talent, a great player," Kovac told Sport Bild. "Sooner or later, he will certainly leave Leverkusen. There's no doubt we are discussing a future top player." 08.50 BST: Brazilian club Flamengo have joined Barcelona and Borussia Dortmund in the race to sign Atletico Madrid left-back Filipe Luis, according to Globo Esporte. It says the former Chelsea player has offers from several clubs, including Barca and Dortmund, to remain in Europe. 08.00 BST: Manchester City are very interested in Atletico Madrid midfielder Rodrigo and are prepared to pay his €70m buy-out clause, Onda Cero reports. According to the Spanish radio station, City coach Pep Guardiola is a fan of the 22-year-old, who has similar qualities to Barcelona midfielder Sergio Busquets. Rodrigo could be one of two players to make the move from Atletico to City this summer sources told ESPN FC last month that the reigning Premier League champions are closing in on a move for midfielder Saul Niguez. The Sun reports that Manchester United could be set to lose the race to sign Portuguese star Joao Felix. It says Real Madrid have been in touch with Benfica over a summer move for a teenager, who has been sensational in the Portuguese top flight this season. Juventus are believed to be keen on bringing him to Serie A, which could leave both United and Manchester City languishing. City's director of football, Txiki Begiristain, went to watch Felix in the Europa League clash against Dinamo Zagreb last month, but neither Manchester club is understood to have made a firm move for the midfielder. The Sun says Spurs want to bring Lazio keeper Thomas Strakosha to the club as a long-term replacement for Hugo Lloris, who made a costly late error in Tottenham's 2-1 loss at Liverpool on Sunday. Sources in Italy have said Spurs scouts have been to watch Strakosha play several times. The Sun adds that the Albania international could arrive in North London as soon as this summer, probably at a cost of around £35 million. -- Sky Sports reports that Ander Herrera and Juan Mata will be heading out of Old Trafford in May. Herrera is reportedly on his way to PSG, a move that has been on the cards for a while, while Mata could move to Barcelona. -- The Courier Mail says New Zealand international Dane Ingham wants to leave Brisbane Roar for Perth Glory. -- With Zinedine Zidane keen to bring some younger players to Real Madrid, the club are targeting Esteban Aparicio of Rayo Vallecano and Rayo Majadahonda midfielder Fernando Delgado, according to Marca.